Comparing SharePoint 2016 and Office 365 – Which SharePoint Is Right for You? A few years back choosing a SharePoint technology was simple. You had two choices; 1) SharePoint Server or 2) SharePoint Foundation. Fast forward and now you have SharePoint 2016, Office 365 and SharePoint online. Note that Foundation is no longer offered. With the approaching general availability of SharePoint 2016, you are likely looking toward the new platform and trying to determine whether it is right for your organization. At one time, the latest version of Microsoft’s on premises platform was your only option for an upgrade, but with the rise of cloud and hybrid computing, those days are long gone. Now, you have a variety of options to choose from – and one of them is probably right for you. Deciding whether to deploy (or migrate to) SharePoint 2016, Office 365, SharePoint Online, or a hybrid model that combines the two depends on your organization’s compliance, business, and technical requirements. In this blog post, I will review your options and provide steps you can take to make an informed decision on which path to choose. To get started, you need to obtain requirements and collect supporting materials that will enable you to design your organization’s SharePoint environment. As you tackle the work ahead, you will engage a variety of people that will help you determine which option is best for your organization. You shouldn’t expect to obtain all the information you require on your own – you’ll need to work with various stakeholders to document what is available and create what isn’t available. Before you begin the requirements and design process, you must assemble a team that will contribute to both the analysis of and decision regarding which option is best. Business – This representation is critical and often overlooked, which can lead to poor adoption and perceived failure of a project by the business. The role of the business representative is to provide insights as well as prioritize requirements and substantiate them. 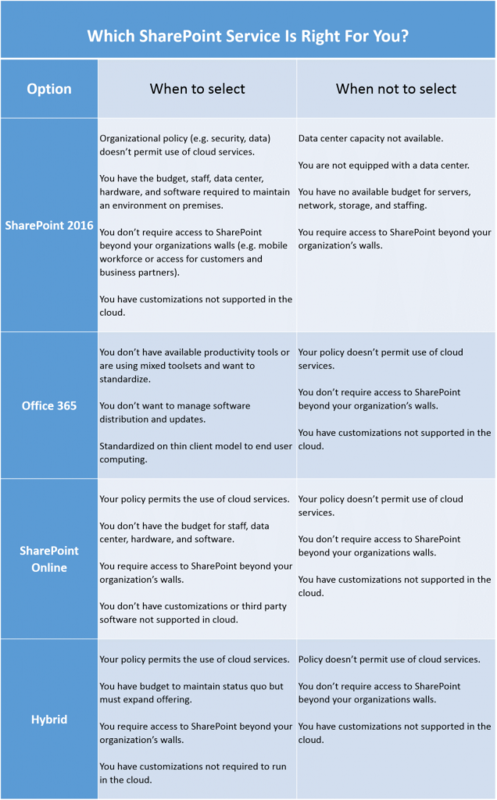 Security and Data Managers – You will need to know your organization’s security policy when it comes to SharePoint – especially if you’re considering the cloud. In some cases you might have compliance requirements and strict guidelines to follow. Staffing your project team with a security manager and records manager is a must. IT – This includes all the disciplines in the IT department that are involved with technology solutions across your organization. It should include architects, operations (administration, monitoring, and help desk), infrastructure (servers, storage, and network), identity management, and project management. Third Party – This could include outsourcing partners, product venders, and consultants involved in the project. The best way to identify the parties is to list products incorporated into the solution as well as any parties involved with support and administration. Some maybe obvious, especially if any infrastructure is hosted offsite or third-party staff is helping operate the solution. Before we dive in the options available to you, let’s first review the differences between on-premise and a cloud offering such as Software as a Service (SaaS). The following diagram contrasts on-premises (SharePoint 2016) and SaaS (e.g. Office 365 – SharePoint Online). As you can see, your organization has many options, but which do you chose? First off, it’s not just a technology choice, it’s about making an informed decision so that your organization achieves the expected outcomes. The following steps will help you collect the information required, present the necessary decisions, and get buy in in order to make an informed decision. Get facts on paper – As you meet with stakeholders and team members, document and distribute information. Document all requirements, decisions, issues, and risks throughout the project – make sure there is measurable traceability. This will be important because projects can take a significant amount of time to complete and people forget what the team agreed to. If you’re on SharePoint already, use a site to house, distribute, and track content. Finally, create a communication plan that details the communications, to whom, how often and the format. Conduct a risk assessment with the team – The project team must work collaboratively to identify any risks, their likelihood of occurring, the impact if they occur, and a plan for each (e.g. mitigate or accept). The risk plan should be maintained by the project manager throughout the project. Also, the risks should be assigned to the team members to be addressed. Conduct a data analysis – You probably have multiple data sources in your organizations such as file shares, existing SharePoint farms, and legacy applications such as Lotus Notes. Each data repository must be assessed against your data and security policies utilizing discovery tools. Conduct a farm analysis – For each existing SharePoint farm, document the configuration (site collections, services, and features activated), third party tools, and customizations. In addition, conduct an inventory of the sites to determine which are using the third party tools, customizations, and if site ownership is up to date. Define service level objectives and end user agreements – Services levels build on metrics for success and are focused on SharePoint as a service. These metrics include availability, performance, provisioning timeframes, and the responsibilities of each party involved. Responsibilities should include the specifics on what each party is responsible for to deliver the objectives. Design for functionality, service levels, and capacity requirements – By designing your new environment with functionality, service levels, and capacity requirements in mind, you have substantiated requirements that can be utilized to determine the best platform for SharePoint. This will help you decide whether to utilize physical or virtual servers, or move to the cloud. Once you learn about your options, gather requirements, design an operational plan, and gain stakeholder buy in, how do you decide what’s next? The following table will help you decide which option is best for you. Armed with the information above, you should be able to begin to work through the process of determining which SharePoint option is best for you. Most importantly, your organization must do it homework to determine compliance and data/security policy as well as business, technical, and operational requirements. Once you have completed this work with the appropriate parties in your organization, the decision process will become clearer and easier to sell.